You are here: Home / Articles / Food & Health News / Three Squares a Day Disappearing? Three Squares a Day Disappearing? Do Americans snack too much? The answer is yes given the results of a recent study in the American Journal of Clinical Nutrition that looked at the daily eating patterns of Americans of all ages over the past 30 years. 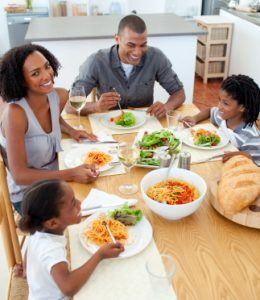 The researchers ask, “Does hunger and satiety drive eating anymore?” Probably not, since both children and adults were found to eat more frequently and consume more calories per day from snacking. While nutrition experts tout the benefits of eating small meals and several snacks throughout the day, consumers seem to be overdoing it when it comes to putting that advice into practice. Many people still skip breakfast, and many are self-professed “grazers” throughout the day. Both of these habits contribute to consumption of more calories throughout the day. The best advice may be what you’ve all heard for years — get your three square meals first. If you need more food, add on from there by choosing healthy snacks such as fresh fruit and nuts. The most sane thing I have read about diet in quite some time. Cheers.